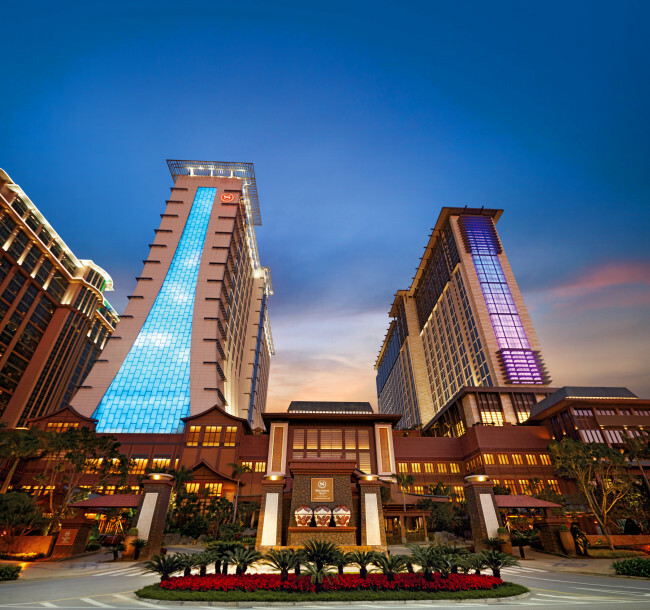 MACAU -- China’s autonomous region of Macau is one of Asia’s top tourist destinations to enjoy gambling, entertainment and nightlife. The mesmerizing nighttime view of extravagant casinos shows why the city became known as the Vegas of the Orient, but Macau also has rich tourist attractions for travelers of all ages. 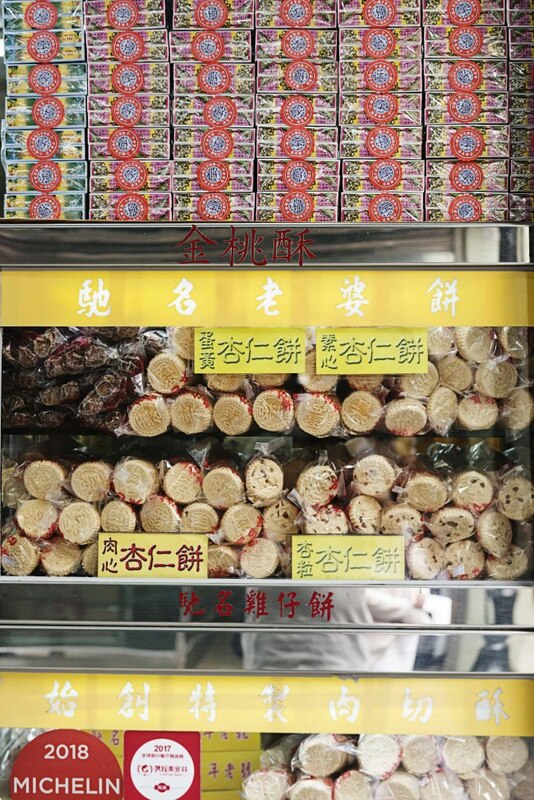 The historical background of Macau, which was a Portuguese territory until 1999, creates a unique atmosphere that permeates every nook and cranny of the city, including its food scene, historical sites and lifestyle. The Portuguese took Macau in the mid-16th century, and the island was under Portuguese rule for over 400 years before it was handed back to China in 1999. The intervening centuries left their mark on the city, including in its beautiful architecture and historical attractions. The Ruins of St. Paul’s form arguably the city’s most famous landmark, captivating tourists centuries after it was constructed. Built from 1602 to 1640 by Jesuit priests, the Portuguese church originally included St. Paul’s College and the Church of St. Paul, also known as “Mater Dei.” Today, however, visitors can only see the facade and crypt of the beautiful old church, after it was destroyed by a fire during a typhoon in 1835. 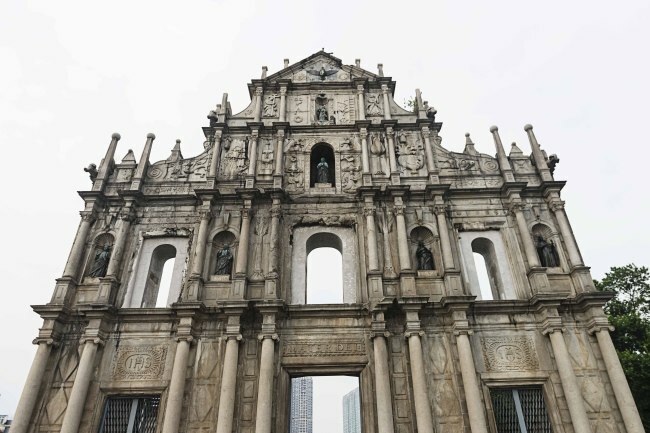 The surviving granite facade reflects European and Asian influences on the structure, especially through the stone carvings that indicate biblical images, Chinese characters and a Portuguese ship. 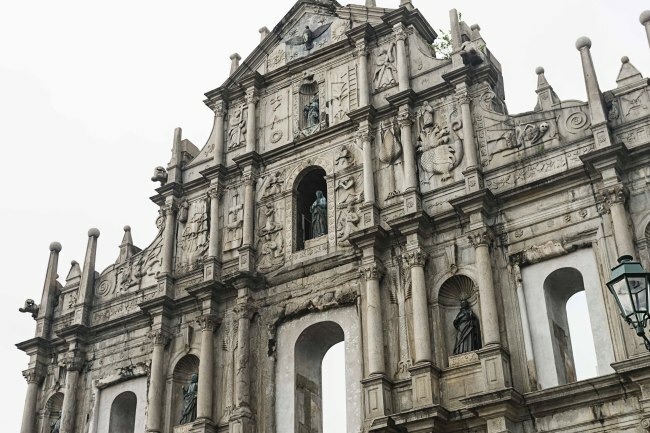 The ruins were officially listed as part of the Historic Center of Macau, a UNESCO World Heritage Site, in 2005. Strolling down the grand stone steps beneath the facade and taking a short walk of about seven minutes, visitors encounter another World Heritage Site in Senado Square. 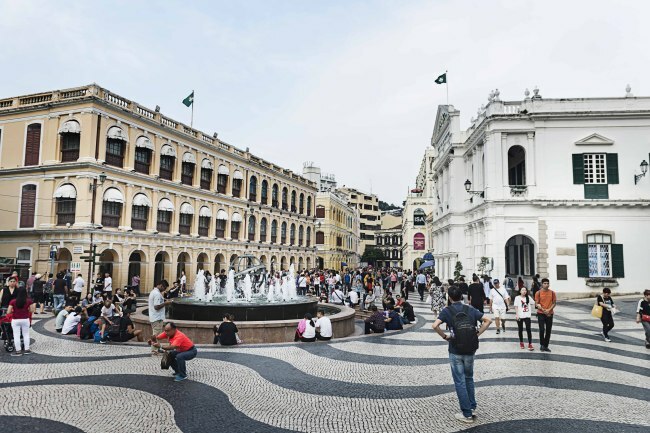 The 3,700-square-meter public plaza has served as Macau’s urban center for centuries, enclosed by the former Portuguese government’s Leal Senado building, the General Post Office and St. Dominic’s Church. The pastel-colored neoclassical buildings surrounding the square and wave-patterned mosaic paving emphasize the city’s Mediterranean influence. 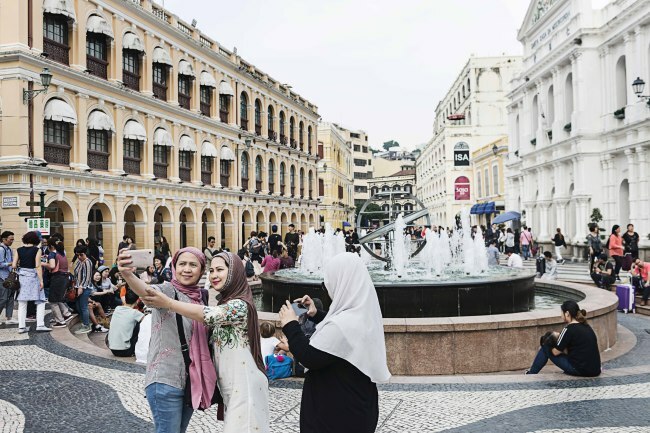 The tourist-packed square features a variety of shopping centers and restaurants, while loads of events and celebrations such as firework displays and lion and dragon dances are also held at the plaza on special days. For travelers who want to escape the touristy areas, exploring Taipa Village can be a perfect alternative to experience an authentic slice of Macau. Located just a few minutes’ walk from the main casino strip, the tranquil town welcomes visitors with historic buildings and museums. At the same time, the street is filled with hip and trendy local stores, eateries and art spaces that create a great mix of old and new. Food street Rua do Cunha in Taipa Village provides a wide range of tasty snacks and pastries, including the famous Portuguese egg tart, pork jerky, curry fish balls, pork chop buns and durian ice cream. As vendors offer free samples, customers can try a wide selection of edible souvenirs for friends and family. Besides the sightseeing spots, Macau also offers some thrilling activities to enjoy. The world’s highest bungee jump platform, 223 meters up the Macau Tower, is one of the most nerve-racking experiences to be found in Macau. Night bungee jumping is also available from 6 p.m. in the winter and 7:30 p.m. in summer. The hotels at Cotai Strip offer a great selection of high-quality shows and performances ranging from stunts and acrobatics to magic shows. Fountain shows staged in front of the hotels are likewise entertaining attractions not be missed. A vibrant mix of Portuguese and Chinese cultures can clearly be found in Macau’s dining scene. Macanese cuisine features unique dishes that blend ingredients and cooking techniques from local Chinese and Portuguese cuisines. Among the many local specialties, the Portuguese egg tart is arguably the city’s most famous snack. Since British pharmacist-turned-baker Andrew Stow added a local spin to the Portuguese pasteis de nata recipe in 1989, eating a freshly baked egg tart pastry from Lord Stow’s Bakery has become one of the must-try experiences for any visitor to Macau. Travelers in Macau can encounter various seafood recipes that originated from Portugal as well, including fried bacalhau, or cod, boiled clams and Portuguese seafood rice. 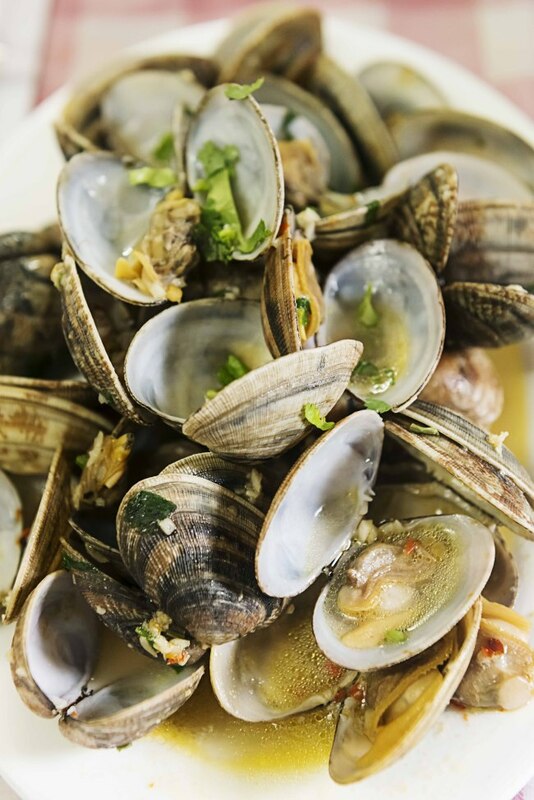 A Petisqueira in Taipa Village is renowned for serving authentic Portuguese food among the locals with its signature octopus salad, fried clams, grilled chicken and roasted cod dishes. 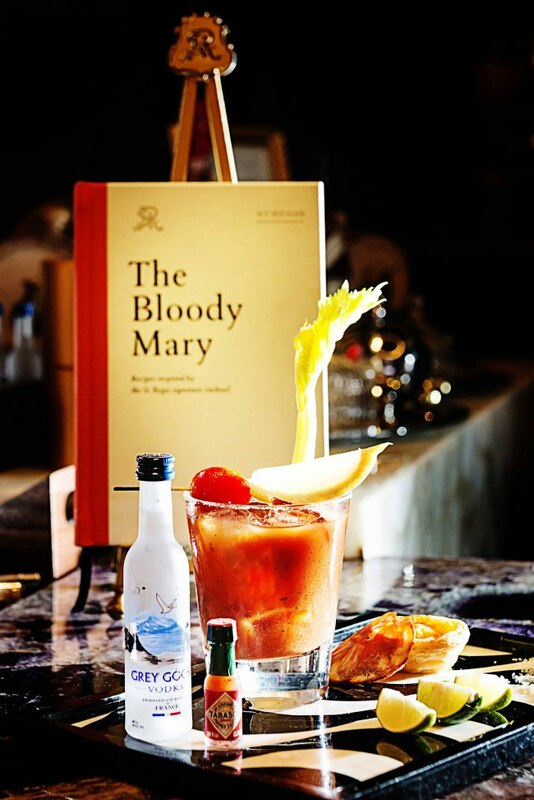 The Macanese version of the Bloody Mary cocktail can be fun experience to please the palate. 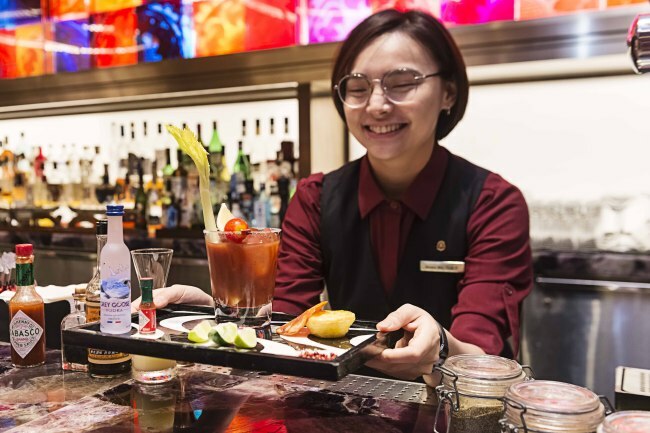 Expert bartenders at the St. Regis Bar, located on the first floor of the St. Regis Macao hotel, serve their interpretation of the signature Bloody Mary, infusing traditional Portuguese ingredients into the drink. Dubbed “Maria do Leste,” or Mary of the East, the cocktail is made with various spices such as sea salt, piri sauce, ground cinnamon and black pepper. 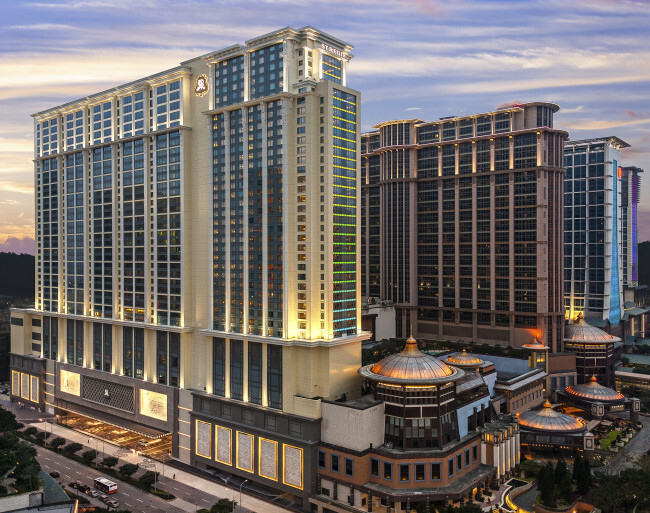 Located at the heart of the Cotai Strip, the world’s largest Sheraton and Macau’s biggest hotel has more than 4,000 rooms and suites. 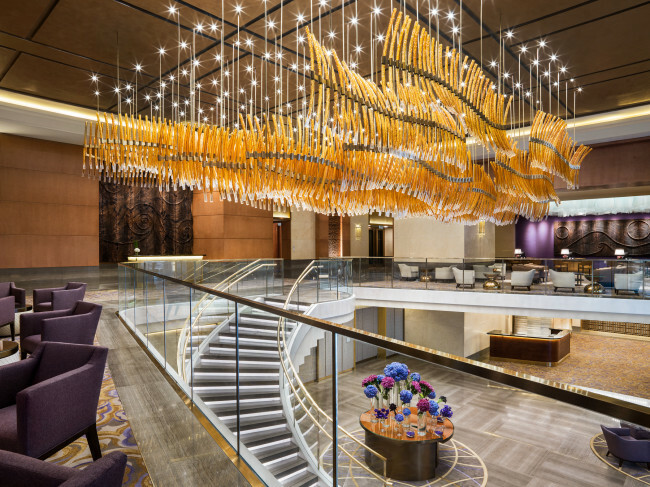 Sheraton Grand Macao is within walking distance of more than 850 retail shops, dining places and world-class entertainment, while still only a five-minute drive to Taipa Village. 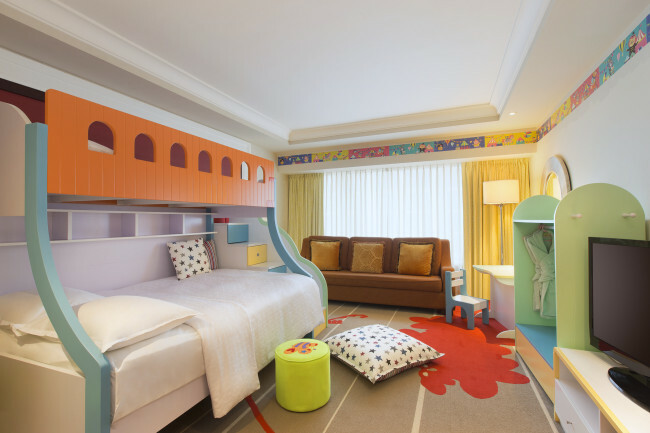 The family-friendly hotel is considered a great option when accompanied by young guests, as the hotel provides Family Suites, a kid’s salon, shallow pool, indoor theme park and babysitting services. 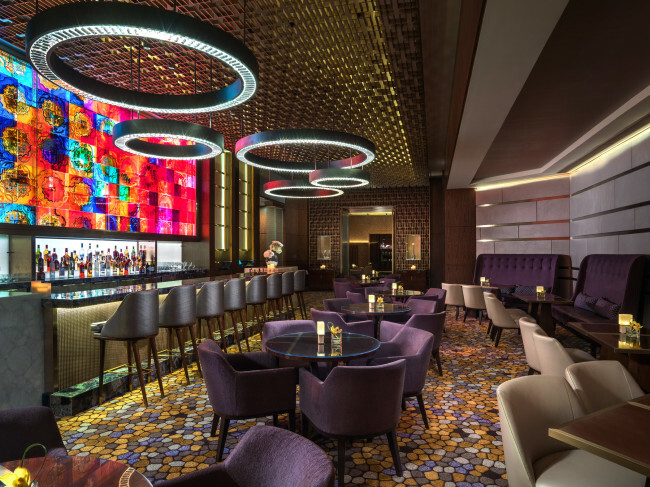 Sheraton Grand Macao features highly acclaimed restaurants and bars in the hotel, including Italian trattoria Bene, all-day dining buffet Feast, traditional Chinese restaurant Yum Cha and modern cafe and bar Palms. 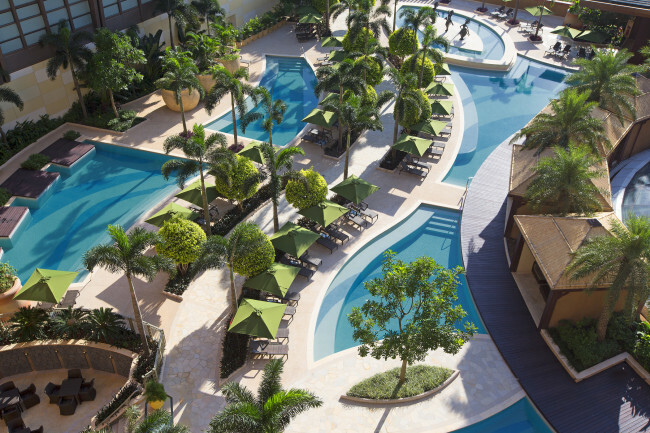 The hotel is offering its “Stay and Savor” package for visits through Jan. 31, 2019 in a deluxe king or twin room, including a full buffet breakfast and complimentary dining credit of 500 patacas ($62). 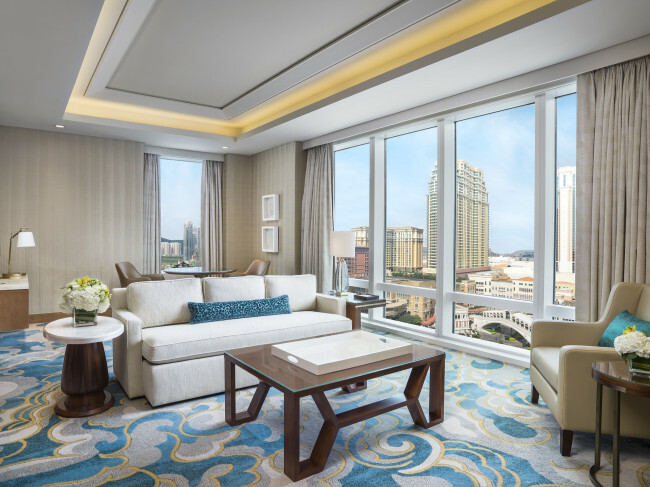 Luxury hotel chain St. Regis Hotels & Resorts opened The St. Regis Macao on the most prestigious address on the Cotai Strip in 2015, offering 400 exquisitely styled guestrooms. 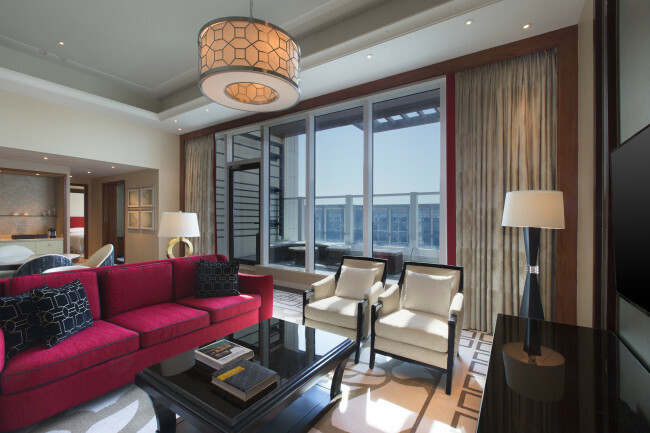 The St. Regis Macao is the only hotel in Macau that provides its signature butler service for guests, 24 hours a day, customizing each guest’s stay to their specific needs, tastes and preferences. Guests can go on a gastronomic ride at oyster bar and grill The Manor, located on the first floor of the hotel, which is known for serving the freshest seafood, prime meats and Portuguese cuisine. The Iridium Spa on the top level of the hotel helps guests relax and unwind after a long day, with specially developed gemstone treatments. All treatment rooms are equipped with an individual bathroom and jacuzzi.